Available in 5 standard sizes, this innovative design can be worn under most regular clothing and will fit most infants, and small children. The small sealed battery (similar to a watch battery) and tone generator easily unplug to allow normal cleaning and care. Criss Crossers are a simple and effective method of discouraging w-sitting without putting any other positional limitations on children. 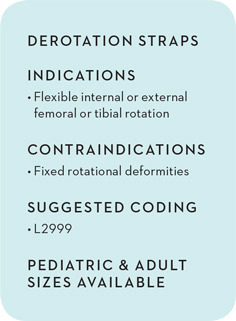 The SureStep De-Rotation Straps offer dynamic control for mild femoral or tibial rotation. The latex-free elastic hook-and-loop strap system easily attaches to shoelaces or to lower extremity orthoses. And its low-profile design easily hides under clothing. Available in both beige and white, the universal “pediatric” size will fit patients up to 5 ft. tall. Also available in a universal “adult” size, these devices can be custom-fitted to the patient simply and quickly. This product gives O&P professionals and physical therapists an easy-to-use solution for flexible internal or external femoral or tibial rotation.